superdumb supervillain: PLNDR Shoes for a Year! PLNDR Shoes for a Year! PLNDR is Karmaloop's flash sale site and it features stellar deals on clothing and accessories from top urban streetwear brands. Some items are up to 90% off! Like their cousin, PLNDR likes to hold crazy giveaways. 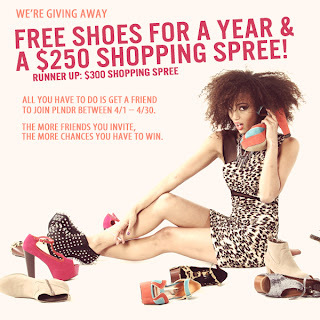 This month's contest: invite your friends for the chance to win free shoes for a year PLUS a $250 shopping spree. Note: there are jeans on sale on PLNDR right now for $10… that prize could go pretty far! In accordance to the FTC Guidelines and the WOMMA Code of Ethics, I am disclosing that I did not receive any compensation for posting about this contest. I just like shoes and if you join PLNDR via my link, I'll be entered to win a year's worth. All opinions are, as usual, strictly my own.